Like many countries with strong Catholic/Christian culture and traditions, Italy marks the weeks leading up to Lent with colorful, sensual, food- and drink-filled celebrations. In Italy, it’s called “Carnevale,” derived from Latin “carnem levare” — take the meats; in ancient times that referred to the banquet on the last day before the long Lenten abstinence from meat. Carnevale continually evolves — its roots harken back to the Roman Saturnalia festival to ring in the new year. Back in medieval days it was an opportunity for lower classes to upend and subvert norms; they wore masks so they could pretend to be anyone, even if only for a day. Lively masks remain a fun part of Carnevale. 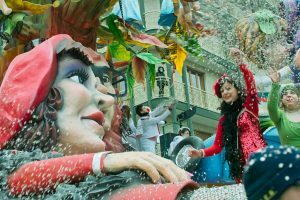 JOIN THE CANDY BATTLE — In the Marche region of central Italy, Fano may put on the sweetest version of Carnivale; Fano’s is also the oldest Carnivale celebration, dating back to 1347. Its months-long festival culminates in a parade during which hundreds of kilos of chocolates and other candy are thrown from floats out into the crowds. Young and old alike throw sugary ammo at each other. WARM UP — If any region of Italy is likely to be on the warm side, it’s Sicily. Acireale, with its gorgeous Baroque center, has one of the most beautiful versions of Carnevale. Parades feature floats with characters and images made exclusively with flowers. HIT SEVERAL PARTIES — Supposedly Puglia has more Carnival celebrations than any other region in Italy — going there makes it easier to try out more than one municipal party. One city there, Putignano, has what may be Italy’s longest Carnivale! It starts December 26, right after Christmas. December 26th has the Festa delle Propaggini, where poets recite satiric rhymes about politicians, powers and social news or habits for hours. Parades begin in February. WATCH TUSCAN PARADES — While Viareggio, a resort on the Tuscan coast, is comparatively small (pop. about 64,000), its Carnevale is one of the country’s largest. Long, lively parades are known for huge paper mâché caricatures of politicians, animals and other figures. Viareggio is easily accessible as a day-trip from nearby Lucca and Florence. Carnevale is just one of many ways that Italian culture adds to Italy being a great place to visit. Knowing even a little Italian can make your visit even more fun. You’ll be able to take part more fully in Carnevale and other Italian events when you can communicate with locals in their tongue. What’s more, proficiency in a foreign language can help keep your mind running better throughout your life. Take advantage of the many moderately-priced classes and events happening here at Sentieri Italiani! « A Little Taste of Basilicata in Chicago!